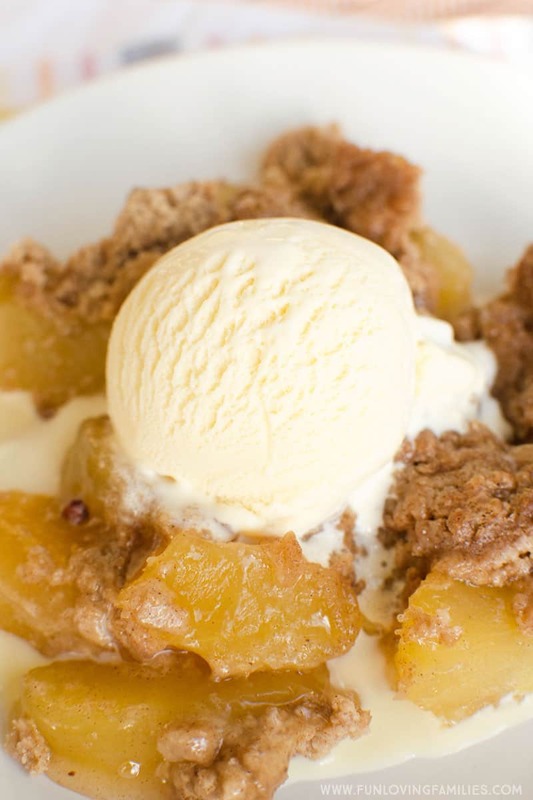 This delicious apple spice dump cake is one of the easiest Instant Pot desserts you can possibly make. 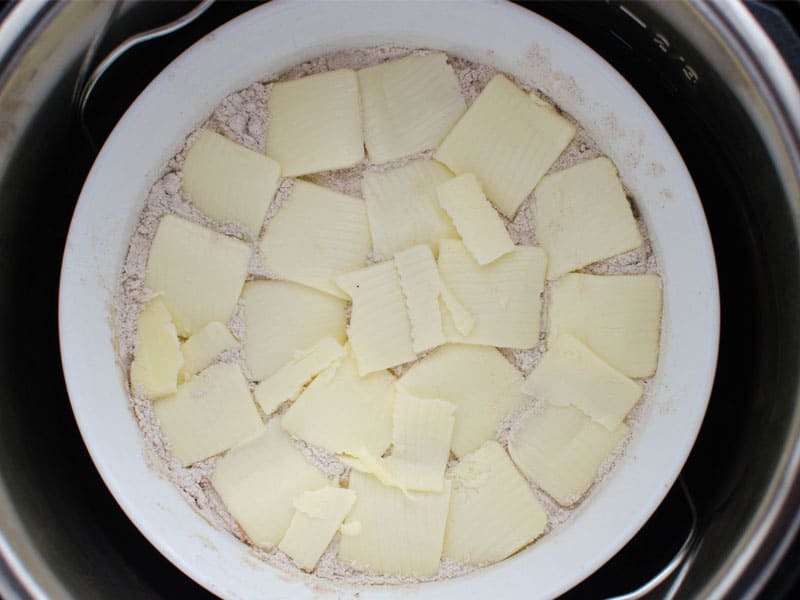 With just three ingredients, this Instant Pot dump cake will be ready in under an hour from start to finish. It’s still hotter than Hades here in North Carolina, so we aren’t quite ready to put away the flip flops and bring out the sweaters. But, that doesn’t mean I’m not ready for fall food. I’ve spent the past couple weeks trying to find a good breakfast pumpkin bar, but so far I haven’t found what I’m looking for. In the meantime I ended up making about a half a dozen of these dump cakes, trying different combinations and such, and I’m totally in love with this apple spice cake. If you love Instant Pot dump recipes, be sure to check out these 25 Instant Pot dump dinner recipes. 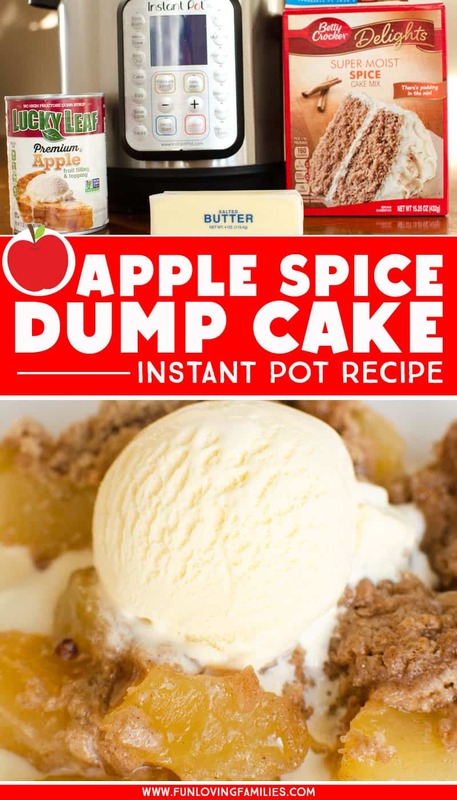 I found so many Instant Pot dump cake recipes when I was searching for Instant Pot desserts, and the basic steps of the dump cakes are pretty similar – add your can of fruit pie filling, top it with a cake mix, then cover with butter. This recipe uses the pot-in-pot method. Add 1 cup of water to the bottom of your Instant Pot pan. Place your trivet (that came with your Instant Pot) into the bottom of the pan with handles up. 7. 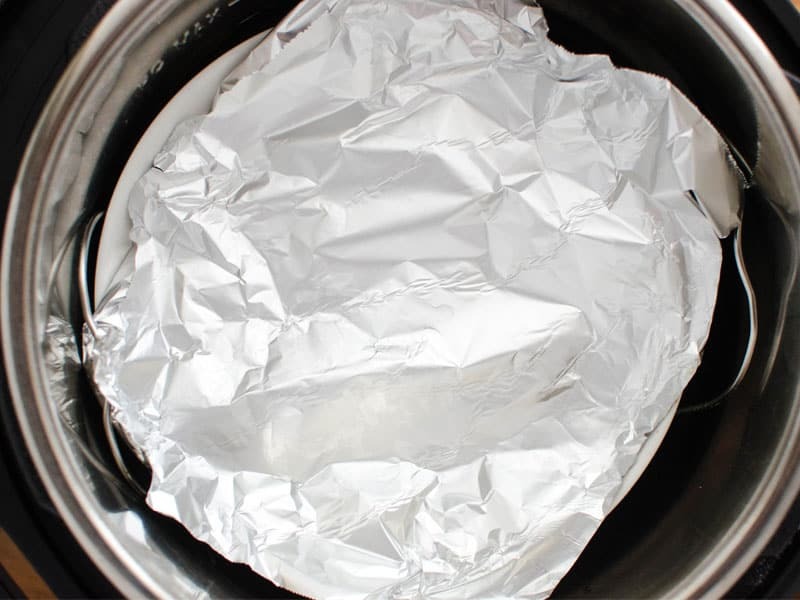 Recommended – loosely place a square of aluminum foil on top of the baking dish (this is to help keep water from dripping onto the cake as it cooks). 8. Make sure your IP pressure valve is set to “seal”, and pressure cook for 25 minutes. 9. Allow to naturally release for about 5 minutes, then do a quick release. 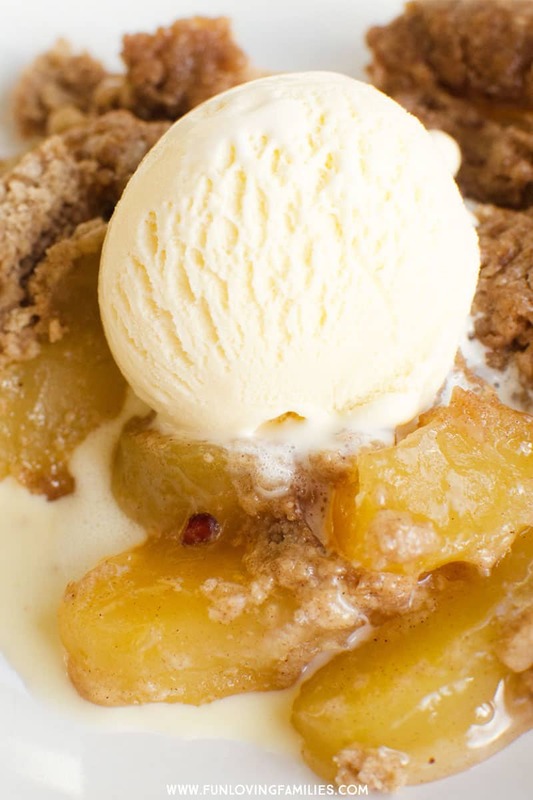 Scoop out your apple spice dump cake and enjoy! The cake is best when it’s warm, but you can reheat it in the microwave if you don’t eat it all right away. Also, it’s good on its own, but this Instant Pot dessert goes to a whole new level when you add a scoop of vanilla ice cream to the top. We used salted butter because it’s what we had on hand. I didn’t notice, but I ate mine with ice cream. However, my husband ate his without ice cream and mentioned it was a little on the salty side. If you’re sensitive to salt, you might want to go with an unsalted butter. Any other questions or ideas? Let me know in the comments! Click here to follow my Instant Pot Pinterest board for tons of great recipes, and share the image below! Pumpkin spice…Apple spice…I’ll happily take them both! I’ve seen others use a full box along with 2 cans of fruit, but my baking dish is only about 4 or 5 inches tall and I didn’t want to risk it being too full. If you have a bigger Instant Pot that can handle a bigger dish, then you might want to go ahead and try doubling the recipe. Hello, This is a fantastic quick recipe, thank you for sharing it with us. I am a food lover and I love making bread and butter pudding. Oh, no! That sounds terrible. 🙁 The butter is supposed to seep into the cake mix beneath it as it melts, so I’m not sure why your butter puddled at the top. Occasionally there are some dry spots in the cake mix, which is why it’s so important to get the butter spread out enough to cover the entire top. I’m sorry the recipe didn’t work out for you! Do you pressure cook on normal or high? The model I use doesn’t have a high or low setting, but I believe it would be the equivalent of the high pressure cook setting on other cookers. Thanks!